During the 2016 edition of the Festival della Valle d’Itria, students will have the opportunity of gaining specific practical experience, thus enriching their training. They will be guided by great supervisors, prominent interpreters and concert-masters. •	the THIRD SESSION (from the 7th to 29th June 2016) will be dedicated to specific study. 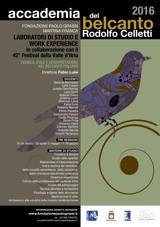 A selection of students identified as suited for the position will engage in a phase of practical work experience within the 42nd edition of the Festival della Valle d’Itria (www.festivaldellavalleditria.it). •	in Martina Franca at the Fondazione Paolo Grassi (the headquarters of the Accademia) on the 15th March 2016 at 10am. Further auditions may take place (under specific request and agreement from the Accademia Directiors) in Milan, Zurich, or other places and dates to be defined at a later stage, but strictly before the 15th March 2016. No candidate will be admitted to the course, work-experience, or Festival collaborations without having paid the tuition fees. Lessons will take place mainly at the ‘Fondazione ‘Paolo Grassi’’ in Martina Franca. Practical work experience will take place, apart from the above-mentioned location, in the areas dedicated to the Festival della Valle d’Itria.